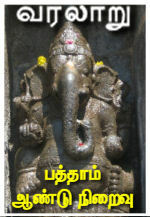 Both the Dvarapalas are standing facing each other. 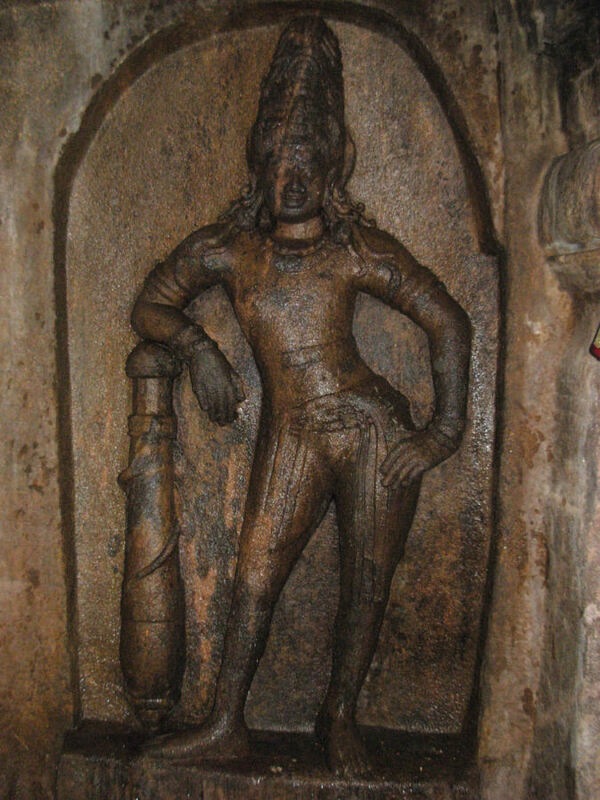 The dvarapala in the south is standing with his right leg in sama and left leg in parsva whereas the northern dvarapala’s legs are in tryasra but oppositely turned. As like, the southern dvarapala’s right hand is in Katyavalampita and the left hand is resting on the plank. The northern dvarapala’s left hand is on the thigh and the right hand is resting on the plank. Both their planks are snake coiled, ornamented and heavy with pointed tip resting on the niche floor, bulging in the middle with upward tapering and finished with a round tip. Their locks are gathered at the apex and fastened as a high jatamakuta, few unfastened tresses floating on their shoulders add grace to their appearance. With spewed out eyes and elongated ears they are decked with ornaments like head patta, snake coil armlets, bangles, charapali, beaded necklace and udarabandha. The southern dvarapala is wearing a stone studded udarabandha and a beaded yajnopavita which is absent to his counterpart. The kundalas on their ears are like a bunch of droplets suspended on a ring. Both are wearing tightly tucked half dress in their lower part of the body with a belt fastened around the waist cling to a clip in the center and the remaining girdle drooping on the thigh. Their trim structure with inclined pose, nonchalant look and a slight grin on the face, all add grace to them. Kudumiyamalai is a treasure-trove of inscriptions. Copious inscriptions are found in this temple complex. 119 inscriptions have been copied out of which 45 are found in the rock cut temple alone, numerous inscriptions still remain un-copied from this temple complex. Inscriptions of I Empire Pandyas, Cholas, Muttaraiyas, Velir, II Empire Pandyas, Banas, Hoysalas, Vijayanagar and Nayaks are found. Out of the 45 inscriptions, one of the inscription is the term ‘Parivadini’ found on the back wall of the mandapa, five speak about Thirumerrali Mahadevar and the rest of the inscriptions speak about the endowments to Thirumulattanathu Perumanadigal (Deity in the structural shrine). The inscriptions of the early Cholas constitute major in the rock cut cave. All these shown that the structural temple remained popular in the region and received more patronization than the rock cut shrine. The reason to inscribe the inscriptions of structural temple at rock cut cave temple might be due to its perishable nature (brick work) of structure. The brick structure might have renovated into a stone structure in the later period. Among the five of the inscriptions that speak about the deity of the rock cut cave, three are lamp endowment and two are food offerings. A 14th regnal year inscription of one Parakesari speaks about the endowment of 5 ma and 5 kalanju of gold by one Sadayan Kalacci in favour of Sadayanambi of Parambaiyur and the interest accruing from the deposited amount to be used for feeding 15 Maheswaras during the period of Masimagam for seven days. The endowment is made for Thirumerrali Perumanadigal. The inscription mentions the village Thirunalakkundram as a devadana. An inscription of one Parakesari speaks about the endowment of 5ma and one kalanju of gold for Thirumerrali Mathevar for Masimagam celebration by one Sattam Pidari for Salaiyuttu (may be offering to God while carrying in procession). The village is mentioned as Thirunalakkundram of Kundriyur Nadu. A 15th regnal year inscription of Madurai konda Parakesari (Parantaka I C.E. 907-953) speaks about the endowment 3 kalanju of refined gold for a lamp for Perumanadigal of Thirumerrali, the lamp to be lit during day time by one Virattan of Adiyaraiyamangalam in Mipulai nadu, he was the person who prepare sandal paste for the Prince. A 17th regnal year inscription of Madiraikonda Parakesari (Parantaka I) speaks about two endowments and one of the endowment to Thirumerrali Perumanadigal in which 7 ma of fine gold for perpetual lamp by one Nakkan Sankaran of Vanniyur in Nallur nadu. A 5th regnal inscription26 of Rajaraja II (C.E. 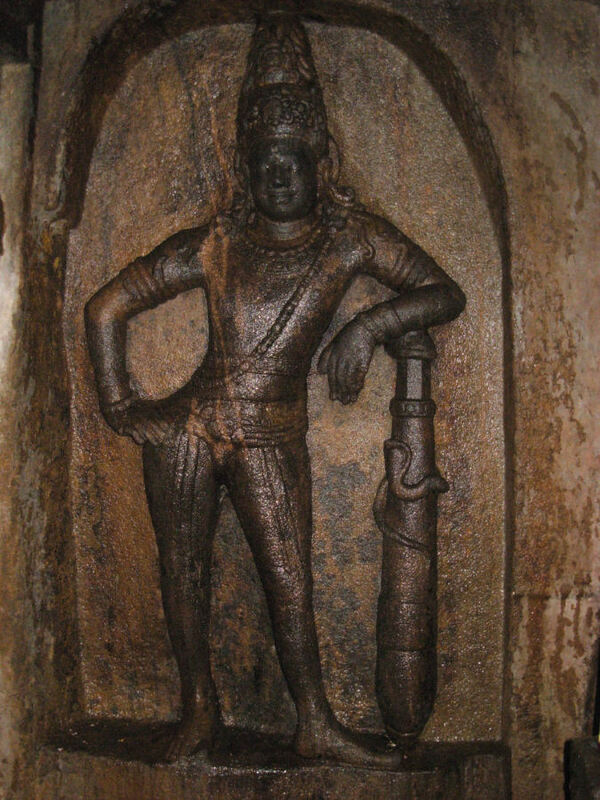 1146-73) speaks about one Vikramalakiya Pallavarayan (a) Narran Periyan one of the Marava chief or nobleman of the Ahambadi sect, serving under Kulothunga chola Kadambarayan (a) Tannan Edirillapperumal, a Sar-araiyan of this nadu made a gift of lamp to the Thirumerrali Mahadevar as the lord of Thirunalakkundram in Kunriyur nadu of Irattapadi konda cola valanadu, for which a ulakku of ghee is to be supplied daily from a flock of 90 sheep. The weight of the lamp and the metal of the lamp is also mentioned. Among the remaining 39 inscriptions two belong to Pandyas of I Empire and the rest belong to the Cholas, and most of the inscriptions belong to the Early Chola period. The two of the Pandya inscriptions forms the earliest available inscriptions of the rock cut cave. The much defaced 23rd regnal year inscription of Pandya Ko Maran Sadayan, (Parantaka Nedunjadaya Varaguna I (C.E. 765-815) speaks about endowment of gold for lamp and the 23rd regnal year corresponds to C.E. 787-88.27 This inscription definitely attribute the presence of the cave during the last quarter of the 8th century AD. Another inscription28 speaks about two endowments at two different years during the King Sadaiyan Maran (Srimara Sri Vallabha C.E. 815-862) one on the 8th regnal year inscription of the king speak about 7½ kalanju of king for lamp and one kalanju of gold for seven day festival. Among the other 37 inscriptions that speak about the endowment to Thirunalakkundrattu Thirumulattanattu Perumanadigal, in which nearly twenty four of the inscriptions speak about lamp endowment to the deity. Most of the inscription mentions the deposit of 7 ma of refine gold for the perpetual lamp. Among this few are royal endowments. The 20th regnal year inscription of Rajakesari speaks about the endowment of lamp by Nangai daughter of Eravagomagalar, wife of Perumpidugu Muttaraiya and sister of Vikramakesari. This inscription reveals suzerainty of the Cholas over the region and also the matrimonial alliance of the Muttaraiyas and the Irukkuvels. The 6th regnal year inscription30 of one Parakesari speaks about the endowment of lamp by Varagunatti wife of Sembian Irukkuvel. The 10th regnal year inscription31 of one Parakesari speaks about the endowment of lamp by Nangai Nandeviyar wife of Sembian Irukkuvel. The Rajakesari and Parakesari mentioned in the inscriptions are the Chola kings prior to Rajaraja I. Besides lamp endowment the other endowments include are food offerings, daily services, services and offerings during festival time. One of the inscription speaks about endowment for daily bathing of the deity in milk at dawn, for that 31 cows were endowed. The endowment was made by Thirai Ammanga Udaiyal wife of Mahimalai Irukkuvel. A 6th regnal year inscription speaks about the sale of temple cows as they were unable to safeguard from theft and the utilization of various services for God on the acquired money. A 21st regnal year of Parakesari speaks about the endowment of a village Munainari Maruthangudi by Mahimalai Irukkuvel as devadana and detailed about various services to be done to the God on the income from the lands. Two of the inscriptions speaks about the Chola Prince Kothandaraman son of Parantaka I, who endowed gold for lamp to the deity. The 36th regnal year inscription of Kulothunga Chola I speaks about business agreement regarding betel leaf trade and supply of 50 bundles of betel leaves and 33,000 arecanut for the God annually. A 16th regnal year inscription of Rajaraja Deva II speaks about conducting festival and maintaining a matt, for that land was allotted to one Velan Kodandan and boundaries of the lands are also mentioned. The Grantha inscription present on the back wall of the mandapa is dated as C.E. 7th century by Scholars. Hence on the basis of Grantha inscription the rock cut cave can be assigned with the period C.E. 7th century. The other earliest available inscription of the rock cut cave is the 23rd regnal year inscription of Varaguna I (C.E. 765-815) which corresponds to C.E. 787-788 confirms the existence of the rock cut cave around the end of C.E. 8th century. 19. ibid., சு.இராசவேல், அ.கி.சேஷாத்ரி, 'இவ்விருவரும் கதையைக் கையில் பிடித்து சிறிது சாய்ந்த நிலையில் காணப்படுகின்றனர்'.. The statement of the authors is wrong, both the Dvarapalas are resting their hand on the gada. P:171. 20. மு.நளினி, இரா.கலைக்கோவன், புதுக்கோட்டை மாவட்டக் குடைவரைகள், டாக்டர் மா.இராசமாணிக்கனார் வரலாற்றாய்வு மையம், திருச்சிராப்பள்ளி-18. P.281.